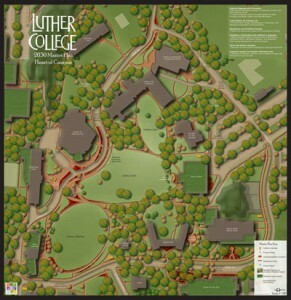 The Kestrel Design Group, Inc. worked with Luther College to create a sustainable Master Plan which reflects the College’s rich cultural and natural history. Luther College is nestled in a scenic river valley on the outskirts of Decorah, a small town of 8,500 in the bluff country of northeastern Iowa. Since the founding of the College in 1861, Luther College has seen much growth and change. In 1909, Jens Jensen, a formative landscape architect in the prairie school of design, was brought to Luther College to restore the oak savanna and meadow, typical of the Upper Iowa River Valley. 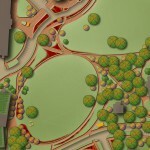 The Kestrel Design Group created a plan to extend the philosophy of Jens Jensen on all campus lands and trails, restoring native plant communities and enhancing campus connections to the land.